A laidback outfit is what Summer style is all about. Relaxing beachside and then heading to the bar, it’s all about finding something that’s going to get you from point A to point B with minimal changes. When it comes to finding a laidback outfit, what better way to get your perfect pick over and over again, than to rent them for a fraction of the retail price! Check out our style guide for 10 laid-back outfit ideas, then head on over to GlamCorner where you can find a laidback outfit for every single day of Summer. Too easy, we say. Made from an incredibly soft sueded silk, the ZIMMERMANN ‘Winsome Flutter Playsuit‘ will take you from casual BBQ to cocktail wedding in perfect style. This laidback outfit is on the top of our ‘Must-Have’ list for summer. Featuring frill detailing along the hem, waistline and along the sleeves, the cheeky cut outs add a touch of drama to the soft design. Because anything and everything in Summer looks that much better when wrapped in crisp white. Opt for something like the MINISTRY OF STYLE ‘Lush Lace Playsuit’ in Ivory for a classic beach to bar laidback outfit this Summer. Pair it with a simple double strap slide and a cute novelty cross-body bag for a top to toe perfect outfit. Perfect for those with an hourglass figure, THE JETSET DIARIES Mediterranean Romper is made from a lightweight silk, the beautiful floral print has us dreaming of Mediterranean holidays. Featuring bell sleeves and a faux wrap-around bodice, when it comes to laidback outfits, this one takes the cake. Dress it up for a Summertime wedding, or go more casual for a cute date night. Summer wouldn’t be right without a touch of colour and crystals, and rightly so. When it comes to colour and crystals look no further thanCAMILLA – the queen of everything patterned. The ‘Constantinople Halter Layered Playsuit‘ is perfect for those who need a laidback outfit for those cheeky afternoon cocktails down by the water. Dress it up with a pair of mules, or go a touch more casual with some crisp white Adidas. Whichever way you like it, you can never go wrong with Camilla. Featuring beautiful balloon-like sleeves and modern pleat detailing, the MINISTRY OF STYLE Fleeting Dress in Nutmeg is our top pick when it comes to finding a laidback outfit suitable for every occasion this Summer. 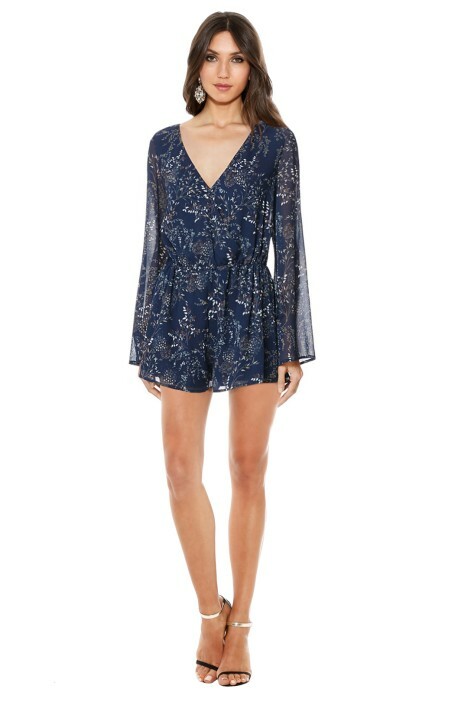 Hit the dance floor and never leave, because this beautiful mini dress will have you wishing you could have danced the night away in the true disco times. Soft and light, when it comes to finding a laidback outfit this Summer, look no further than THE JETSET DIARIES Labyrinth Paisley Mini Dress. For those who love to channel a bit of disco drama, then this is just for you. Perfect for those with a petite body frame, the mini hemline and high neck balance out this design. Pair it back with some chunky wedges for a full 60s look. Because we’d all love a touch of Mexican Fiestas in our lives, the THURLEY ‘Fiesta Dress‘ can do just that. If you’re looking for a laidback outfit for this summer, then look no further than here. Featuring a beautiful hand-embroidered floral design, the simple a-line skirt keeps the overall shape laid-back and casual while the cut-out shoulders add a touch of modern design to the creatively crafted mini dress. 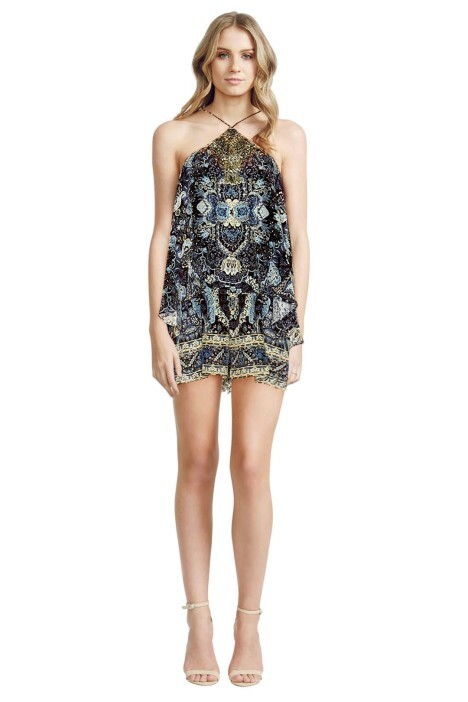 If you love lave, than anything from Self Portrait is perfect for your laidback outfit this Summer. 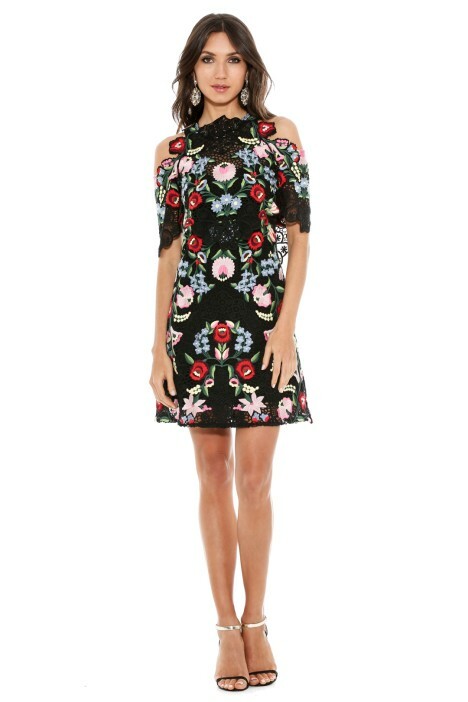 The Antoinette Floral Guipure Lace Dress may not scream Summer, but trust us when we say its warm weather suitable. Made from a gorgeous floral lace, the unlined sleeves make the design shine and the dark design lines make this simple shape even more fashion fantastic. For the more formal of affairs, we’ve got you covered. 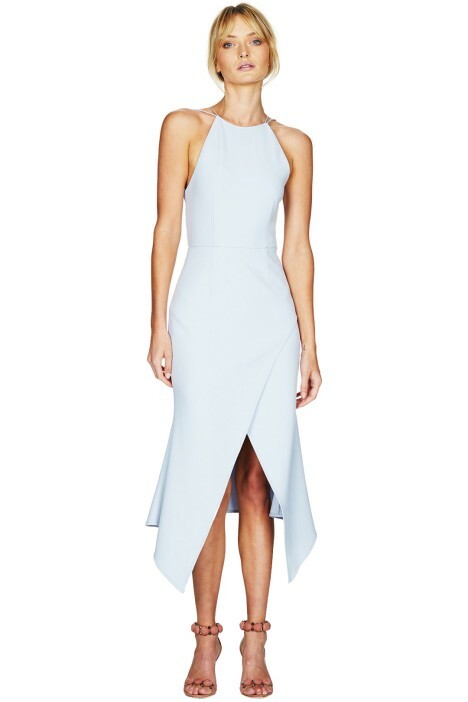 Opt for something like the TALULAH ‘Maison Midi Dress‘. Perfect for those with a pear body shape, the double strapped halter neck-like design shows off your petite upper frame while the semi-fitted cross over skirt adds a touch of modern design to your beautiful curves. Pair it back with a simple single-strap mule for a summer perfect laidback outfit. One of our favourites, the KEEPSAKE THE LABEL ‘Two Fold Dress‘ is our picture perfect idea of laidback outfits for the warmer Summer weather. Perfect for afternoon work cocktails, or even a semi-formal wedding, the beautifully simple design is classy and elegant. With a knee length hemline and a double layered off-the-shoulder design, this gorgeous dress will be your best friend come Summertime.